All outside corners of assembly are bull-nosed to provide safe, clean edges. Water supply is 1/2 inch IPS for hot and cold lines. Drainboards, backsplash and rolled rims are 14 gauge type 304 stainless steel. Drainboards, when provided, are integrally welded. All rolled edges are high-lighted for enhanced appearance. Faucet holes are 1 1/8" punched on 8 inch centers. Legs: 1 5/8" diameter stainless steel tubing with stainless steel gussets and fully adjustable stainless steel bullet feet. Leg locations fall directly under sink bowls, providing increased stability and maximum weight support. Leg gussets welded to a die-cut heavy-gauge stainless steel reinforcing corner plate. Legs are crossbraced front-to-back. Sink compartments are coved on a full 5/8 inch radius and constructed using state-of-the-art seamless welding techniques. 14 gauge type 430 stainless steel. 14 inch water level, 17 inch flood level. Basket-type waste drains are 1 1/2 inch IPS and included. 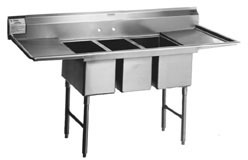 SFN3242-3-14/3 39" x 51" spec-master® SFN series three compartment sink, (3) 32" x 14" bowls. SFN3242-3-18-14/3 39" x 84" spec-master® SFN series three compartment sink, (3) 32" x 14" bowls, (2) 18" drainboard on both ends. SFN3242-3-18L-14/3 39" x 67 1/2" spec-master® SFN series three compartment sink, (3) 32" x 14" bowls, (1) 18" drainboard on left end. SFN3242-3-18R-14/3 39" x 67 1/2" spec-master® SFN series three compartment sink, (3) 32" x 14" bowls, (1) 18" drainboard on right end.